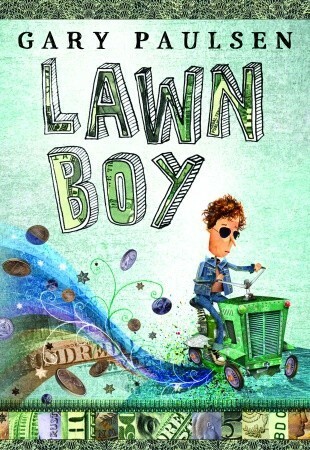 If I couldn't see Gary Paulsen's name on the cover, I never would have believed he wrote Lawn Boy. It is such a departure from his boy vs. wild novels. Instead, Paulsen decided to teach about capitalism and the stock market in a slim volume. When the nameless narrator inherits a lawnmower, he gets asked by a few neighbors how much he would charge to mow their lawns. Things snowball pretty quickly from there and he ends up investing in the stock market, sponsoring a boxer, and earning more money than he ever dreamed. Lawn Boy could definitely be categorized as a "STEM novel." There is a lot of math done in the book, mostly calculating the amount of money earned. I know many students who would be intrigued by how the money multiplies through the stock market. It could be the provocation for a lucrative passion for a young reader. This reminded me a lot of Toothpaste Millionaire; both books are very simple stories about teen entrepreneurs. While there are a few challenges, things work out fairly easily for the protagonists. I hope that Lawn Boy inspires readers to try to start their own businesses, but don't want them to be discouraged when they aren't millionaires after a few months. Still, it would be worth pairing these two novels for summer reading or in lit circles.